This page is for the original game. For the re-release, see Age of Empires: Definitive Edition. Age of Empires Heaven is an active fan website and forum that offers support and extra game content. 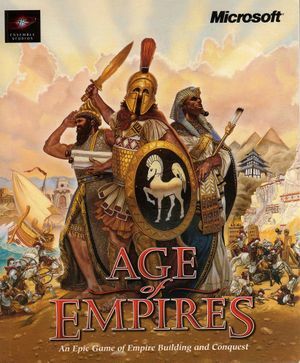 This patch updates both Age of Empires (to 1.0c) and The Rise of Rome (to 1.0a): English, German, and French or Spanish, Italian, and Portuguese. 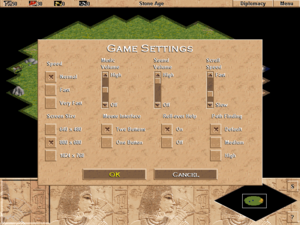 Age of Empires: The Rise of Rome 1.0a suffers from a serious bug in saved games. If a projectile (arrow from archers, ships, towers, siege weapons) is "flying" through the air while saving a game, the saved game becomes corrupted; loading it will crash the game. Unofficial patch that contains bug fixes and improvements for modern operating systems. Does not require any previous patches. Use the NoStartup command line argument. You will need to backup all of the above files and folders to have all of your player data and progress. The only option available is to use one or both mouse buttons. MSN Gaming Zone support has been discontinued. Playing the game on modern versions of Windows may cause it to use weird colors. Repetitive red and purple specks in water and marsh areas are the common issue. This can be fixed by downloading and using DirectDrawFix. Download and extract the DirectDrawFix zip file. Use the browse button to locate and select EMPIRES.exe.